Today we are going to start learning new programming language Python.In recent time it gained popularity because of it’s simplicity and we can complete our program with in fewer lines of code.It is both interpreter and complied. 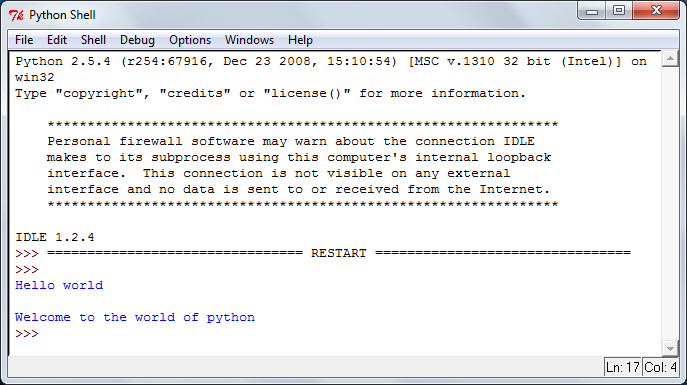 It is developed in the year 1991 by Guido van Rossum.Python is object-oriented and structured programming language supporting both types of formats.You can install python on your system by downloading the files from their site.Today we shall learn about making a simple and basic Hello world program in python langauge. Before writing the program we need to know have basic knowledge.Python doesn’t have any main function,so we need to worry about writing a main function in the program.To print a line we use the keyword print(“”) with the text placed in between parentheses. print "Welcome to the world of Python"
This entry was posted in Python and tagged c program to print hello world, hello world in java, hello world in python windows, java program to print hello world, learn python, print hello world, python examples, python hello world example, python hello world example windows, python hello world main, python hello world script, python program tutorial, python tutorial, python tutorial example, python tutorial for beginners, sample hello world program in python. Bookmark the permalink.